The phylogenetic relationships of Fabaceae, presented on this and subsequent pages, are based on a "supertree" of the family compiled from several recent analyses, including Doyle et al. (2000), Crisp et al. (2000), Kajita et al. (2001), Lavin et al. (2001), Pennington et al. (2001), Herendeen et al. (2003), Luckow et al. (2003), Wojciechowski (2003), and Wojciechowski et al. (2000, 2004), for the treatise Legumes of the World, by Lewis, Schrire, Mackinder, & Lock (2005). 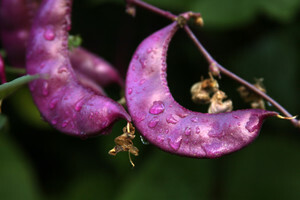 The Fabaceae, also called Leguminosae or bean and pea family, is the third largest family of angiosperms after Orchidaceae (orchids) and Asteraceae (daisies, sunflowers), and second only to Poaceae (grasses) in terms of agricultural and economic importance. Legumes includes a large number of domesticated species harvested as crops for human and animal consumption as well as for oils, fiber, fuel, fertilizers, timber, medicinals, chemicals, and horticultural varieties (Lewis et al., 2005). In addition, the family includes several species studied as genetic and genomic model systems (e.g., pea, Pisum sativum, barrel medic, Medicago truncatula, and trefoil, Lotus corniculatus). Over the past 30 years, the study of legume classification and biology has benefitted from major advances in our understanding of the morphology, evolution and systematics, and ecology of the family (Polhill, 1994; Lewis et al., 2005). Much of this knowledge is recorded in the venerable Advances in Legume Systematics series, first published in 1981 by the Royal Botanic Gardens at Kew, United Kingdom (see complete list below). Coming 25 years after publication of the first volumes of Advances in Legume Systematics (Polhill and Raven, 1981; parts 1,2), the most recent authoritative (and only illustrated) guide to the family, Legumes of the World, by Lewis, Schrire, Mackinder, and Lock (2005, Royal Botanic Garden, Kew) continues that tradition. 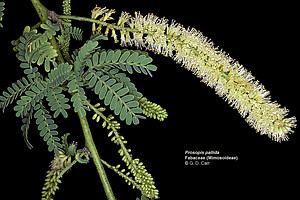 Morphologically, Fabaceae is characterized by leaves simple to compound (pinnate, rarely palmate, or bipinnate), unifoliate, trifoliate (Medicago, Trifolium), sometimes phyllodic (many species of Acacia), or reduced to a tendril (as in Lathyrus), spirally arranged, with stipules present that are sometimes large and leaf-like (Pisum) or developed into spines (Prosopis, Robinia). Flowers are usually regular or irregular (i.e., actinomorphic to zygomorphic in symmetry, respectively), bisexual, with a single superior carpel (hypogynous to perigynous), pentamerous, arranged singly or in racemes, spikes, or heads. The principal unifying feature of the family is the fruit, the legume (Polhill, 1994). With a few exceptions, legumes are typically one-chambered pods (one locule), with parietal placentation along the adaxial suture, ovules 2 to many, in two alternating rows on a single placenta, typically dry and dehiscent along one or both sutures (legume), occasionally constricted into 1-seeded sections (loments) or indehiscent (samara, drupe, achene). For a sampling of legume fruit diversity in Fabaceae, see Fabaceae Fruits. Ranging in habit from large trees to annual herbs, the family is cosmopolitan in distribution and well represented throughout temperate and tropical regions of the world (Rundel, 1989). Legumes are particularly diverse in tropical forests with a seasonally dry aspect and temperate shrublands tailored by xeric climates, but noticeably absent to poorly represented in mesic temperate habitats, including many arctic and alpine regions and the understory of cool temperate forests. The preference of legumes for semi-arid to arid habitats is related to a nitrogen-demanding metabolism, which is thought to be an adaptation to climatically variable or unpredictable habitats whereby leaves can be produced economically and opportunistically (McKey, 1994). A hallmark of legume biology, the fixation of atmospheric nitrogen via root-nodulating rhizobial bacteria, is just one of several ways (in addition to arbuscular mycorrhizas, ectomycorrhizas, and uptake of inorganic nitrogen compounds) in which legumes obtain high levels of nitrogen to meet the demands of their metabolism (Sprent, 2001). Legumes play an important role in the terrestrial nitrogen cycle regardless of whether they form root nodules (Sprent, 2001). Taxonomically, Fabaceae has been traditionally divided into three subfamilies, the Caesalpinioideae, Mimosoideae, and Papilionoideae (although sometimes these have been ranked as separate families, as in Caesalpiniaceae, Mimosaceae, and Papilionaceae), and considered most closely related to the Connaraceae and Sapindaceae on the basis of anatomy, morphology, and biogeographic distributions (reviewed in Polhill and Raven, 1981). The recognition of three subfamilies is based on characteristics particularly of the flower, including size, symmetry, aestivation of petals, sepals (united or free), stamen number and heteromorphy, pollen (single or polyads), but also presence of a pleurogram, embryo radicle shape, leaf complexity, and presence of root nodules (reviewed in Lewis et al., 2005). Differences in these characteristics led to the view that the Mimosoideae and Papilionoideae are unique and distinct lineages in the family which arose independently within a paraphyletic "basal" caesalpinioid assemblage. The Dimorphandra group of tribe Caesalpinieae and papilionoid tribe Swartzieae were considered likely transitional groups between them, respectively (e.g., Polhill, 1994). The last formal classification by Polhill (1994), published prior to the advent of family-wide molecular phylogenetic studies, recognized 39 tribes and some 670 genera. The recent update of the tribal and generic classification of the family, having the benefit from more than 10 years of intensive molecular phylogenetic studies, recognizes 36 tribes, 727 genera and 19,327 species (Lewis et al., 2005). The family contains at least four genera of 500 or more species (Acacia, Astragalus, Crotalaria, and Indigofera) and at least 40 genera with 100 spp. or more. At the other extreme, nearly 500 genera are small, either being monospecific or containing up to 10 species (Lewis et al., 2005). As Lewis et al. (2005) point out, while there has been some disagreement as to whether Fabaceae should be treated as one family (composed of three subfamilies) or three, there is a growing body of evidence from morphology and molecules to support the legumes being one monophyletic family. This view has been reinforced not only by the degree of interrelatedness of taxonomic groups within the legumes compared to that between legumes and its relatives, but also by recent molecular phylogenetic studies (Doyle et al., 2000; Kajita et al., 2001; Wojciechowski, 2003; Wojciechowski et al., 2004) showing strong support for a monophyletic family that is more closely related to Polygalaceae, Surianaceae, and Quillajaceae, which together form the order Fabales (sensu Angiosperm Phylogeny Group, 2003). On this and subsequent pages, the composite or supertree of the Fabaceae constructed by Lewis et al. (2005), derived from a number of recent analyses that are cited here, is presented to provide a "snapshot" of the largely robust (that is, supported by conventional measures of clade support, such as bootstrap and jackknife analyses, Bayesian inference) pattern of phylogenetic relationships in the family, with terminal taxa representing putatively monophyletic groups of genera. Note that many of the tribes, several informally named generic groups, and subfamily Caesalpinioideae, as traditionally circumscribed, are not natural groups and will be so indicated where appropriate. However, it is too premature to recognize many of these newly identified groups as on-going studies seek to further clarify their membership and resolve relationships within them. Thus, for clarity and consistency, nomenclature of both traditionally named and informally named groups will follow that of Lewis et al. (2005). For more information, the Lewis et al. (2005) volume is an excellent source of references to traditional taxonomy and classification as well as contemporary phylogenetic studies of specific groups and should be consulted. Analyses of the plastid rbcL gene played an early role in our evolving understanding of legume phylogeny. Results from studies by two groups (e.g., Käss and Wink, 1996, 1997; Doyle et al., 1997) were largely concordant with earlier work, confirming for example the monophyly of smaller groups suggested by other molecular evidence (e.g., Lavin et al., 1990; Sanderson and Wojciechowski, 1996) or morphology (Chappill, 1995), and the monophyly of the traditional subfamilies Mimosoideae (“mimosoids”) and Papilionoideae (“papilionoids”), nested within a paraphyletic Caesalpinioideae (“caesalpinioids”). Many of these groups have received additional support and have been more clearly resolved by subsequent, more extensive studies using the plastid trnL intron, alone or in combination with morphology (e.g., Bruneau et al., 2001; Pennington et al., 2001; Herendeen et al., 2003), the plastid matK gene and flanking trnK intron (e.g., Hu et al., 2000; Luckow et al., 2003; Wojciechowski et al., 2004), the nuclear ribosomal DNA ITS region (e.g., Sanderson and Wojciechowski, 1996; Allan and Porter, 2000), or a combination of these and other molecular loci (Lavin et al., 2001, 2003). The studies are consistent and show strong support for the relationships between the major subclades in the family, as shown above. The earliest branching clade in the legume phylogeny is tribe Cercideae, followed by two clades composed entirely of caesalpinioid taxa, the Detarieae sens. lat. and Cassieae sens. lat. clades. The subfamily Mimosoideae and the caesalpinioid tribes Caesalpinieae sens. lat. and pro parte, and Cassieae sens. strict. comprise a strongly supported clade that is the sister group to a strongly supported and monophyletic subfamily Papilionoideae. The Fabaceae contains over 19,000 extant species widely distributed throughout the world in many ecological settings, from deserts of high latitudes to seasonally dry and wet tropical forests of equatorial regions (Lewis et al., 2005). Legumes appear to have diversified during the Early Tertiary (Herendeen et al., 1992) to become a ubiquitous feature of modern terrestrial biotas, similar to the timing of diversification of several other modern families of angiosperms (e.g., Fagaceae; Manos and Standford, 2001). Suggestions of a ‘moist equatorial megathermal’ origin of legumes during the mid to late Cretaceous (e.g., Morley, 2000) have supported the long-held West Gondwanan hypothesis for the origin of the family (Raven and Axelrod, 1974; Raven and Polhill, 1981). Although legumes are now highly diverse in tropical to subtropical Africa and South America, the fossil data alone argue against a moist, warm tropical origin or a Mesozoic Age of diversification. The fossil record of the Fabaceae is abundant and diverse, particularly in the Tertiary, with fossil flowers, fruits, leaflets, wood, and pollen known from numerous localities; some examples are shown in the figures below (Crepet and Taylor, 1985, 1986; Crepet and Herendeen, 1992; Herendeen, 1992; Herendeen et al., 1992). Although there are several reports of earlier fossils, Sindora-like pollen (subf. Caesalpinioideae) from the Maastrichtian of Canada, Columbia, and Siberia (Raven and Polhill, 1981) and woods similar to Cassia s. l. and Mimosoideae from the same time period (e.g., Müller-Stoll and Mädel, 1967), they cannot be assigned unequivocally to legumes. The first definitive legumes appear during the Late Paleocene (ca. 56 Mya; Herendeen, 2001; Herendeen and Wing, 2001; Wing et al. 2004). Representatives of all three traditionally recognized subfamilies, the caesalpinioids, mimosoids, and papilionoids (Polhill et al., 1981), as well as other taxonomically large clades within these subfamilies (e.g., “genistoids”), are recorded from the fossil record soon afterward, beginning around 50 to 55 Mya (e.g., Herendeen et al., 1992). Indeed, the occurrence of diverse assemblages of taxa representing all three subfamilies at multiple localities dating from the middle to upper Eocene, especially the Mississippi Embayment of southeastern North America, suggests that most major lineages of woody legumes (except for the tribe Cercideae) were present and extensive diversification had taken place by this time (Herendeen et al., 1992). Caesalpinia claibornensis (subg. 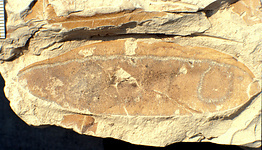 Mezoneuron, Caesalpinioideae) fossil legume (fruit) described from the Middle Eocene (40-50 Mya) Claiborne Formation in western Tennessee. 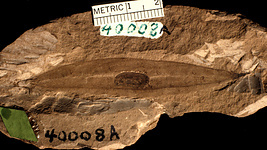 Left: Holotype (IU 15826-5853) showing outlines of seed chambers. Right: Single-seeded fruit (IU 15826-5848). From Herendeen & Dilcher (1991). Acacia eocaribbeanensis (Mimosoideae). 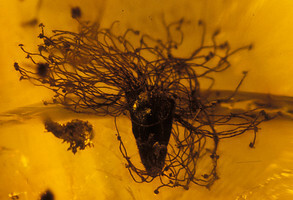 Specimen showing numerous stamens with long filaments (USNM 458372, holotype). From Dilcher, Herendeen, & Hueber (1992). Left: Cladrastis subgenus Platycarpa (Papilionoideae) fossil fruit. See Herendeen (1992) for information on similar fossils of same time period. Right: Diplotropis claibornensis fossil fruit (IU 15826-7235) from the Middle Eocene Claiborne Formation of the southeastern North America. From Herendeen and Dilcher (1990). Attempts to estimate the age of legumes and diversification in the family, based on molecular sequence data, have been published in recent years. Wikström et al. (2001) used a non-molecular clock based analysis of the three gene data set (plastid atpB & rbcL, and nuclear 18S rDNA genes; Soltis et al., 2000) with a minimum age of 84 Ma for the split between Fagales and Cucurbitales as an internal calibration point, and estimated an age for Fabaceae of 74-79 Ma. A comprehensive analysis of rates of molecular evolution and estimated ages for crown groups within the legume family has been presented by Lavin et al. (2005). In this study, Tertiary macrofossils that showed distinctive combinations of apomorphic characters or features were used to constrain the minimum age of 12 specific internal nodes to estimate ages of a number of the clades identified in recent family-wide phylogenetic analyses of plastid matK (Wojciechowski et al., 2004) and rbcL (Kajita et al., 2001) gene sequence data. Their findings indicate the age of the legume crown clade differs by only 1.0 to 2.5 Ma from the age of the stem clade and the oldest caesalpinioid, mimosoid, and papilionoid crown clades show approximately the same age range of 40 to 59 Ma, findings consistent with a rapid diversification of the family soon after its origin during the Late Paleocene. Remarkably, three large clades that include papilionoids traditionally considered derived (Polhill et al., 1981; Polhill, 1994), the “dalbergioids” (Lavin et al., 2001), “Hologalegina” (Wojciechowski et al., 2000), and “mirbelioids” (Crisp et al., 2000), all have ages estimates in the 50-Ma time frame or older. One of these, Hologalegina, contains many of the well-known temperate, herbaceous species of legumes grown as food and forage crops (e.g., alfalfa, clovers, peas, and lentils). Legumes have demonstrated agricultural importance for thousands of years, beginning with the domestication of lentils (Lens esculenta) in Iran dating to 9,500 to 8,000 years ago, their use as a food source during the prehistory of North and South America (beans, more than 3,000 years ago), and their use by the Roman Empire as a food source and for soil improvement (Graham and Vance, 2003). Today legumes are an increasingly invaluable food source not just for humans, accounting for 27% of the world's primary crop production, but also for farm animals (Graham and Vance, 2003). Legumes were grown on more than 13% of the total arable land under cultivation in the world in 2004 (Gepts et al., 2005). Grain legumes alone contribute 33% of the dietary protein nitrogen needs of humans, while soybeans (Glycine max) and peanut (Arachis hypogeae) provide more than 35% of the world's processed vegetable oil and a rich source of dietary protein for the poultry and pork industries (Graham and Vance, 2003). While they produce nitrogen-containing protein in abundance, legumes are deficient in sulfur containing amino acids and other nutrients needed by people and animals. For this reason, legumes and cereal crops are often raised together to account for the amino acids and other elements they are each deficient in (Gepts et al., 2005). The primary dietary legumes grown, such as bean (Phaseolus vulgaris), pea (Pisum sativum), chickpea (Cicer arietinum), broad bean (Vicia faba), pigeon pea (Cajanus cajan), cowpea (Vigna unguiculata), and lentils (Graham and Vance, 2003), include representatives of each of the four clades within papilionoids, the genistoids, dalbergioids, Hologalegina, and phaseoloid/millettioids. See list of agriculturally and economically important legumes. Many legumes form root nodules to fix atmospheric nitrogen in a symbiotic relationship with the soil bacteria 'rhizobia'. Legumes are extremely diverse in their abilities to nodulate, not all species can and there is a wide variety of nodules that form, depending on the species in symbiosis. In addition to their uses as food, legumes are still used as tools in agriculture and forestry as the Romans did. The plants themselves or plant products like leaves and pods can be tilled into the soil as a nitrogen source or legume crops can be rotated with others for soil improvement. These techniques save farmers billions of dollars in the cost of nitrogen fertilizers (Graham and Vance, 2003). Industrially, legumes have many uses in making biodegradable plastics, oils, dyes, and biodiesel fuel. Legumes are used traditionally in folk medicines, but also demonstrate importance in modern medicine. Isoflavones commonly found in legumes are thought to reduce the risk of cancer and lower cholesterol and soybean phytoestrogens are being studied for use in postmenopausal hormone replacement therapy (Graham and Vance, 2003). Legumes also produce a hypoglycemic effect when eaten, making them a recommended food for diabetics (Gepts et al., 2005). Allan, G. J., and J. M. Porter. 2000. Tribal delimitation and phylogenetic relationships of Loteae and Coronilleae (Faboideae: Fabaceae) with special reference to Lotus: evidence from nuclear ribosomal ITS sequences. American J. Botany 87: 1871-1881. Angiosperm Phylogeny Group [APG]. 2003. An update of the Angiosperm Phylogeny Group classification for the orders and families of flowering plants: APG II. Botanical J. Linnean Society 141: 399-436. Chappill, J. A. 1995. Cladistic analysis of the Leguminosae: the development of an explicit hypothesis. Pages 1-10 in Advances in Legume Systematics, part 7, phylogeny (M. D. Crisp and J. J. Doyle, eds.). Royal Botanic Gardens, Kew, UK. Chase, M. W., D. E. Soltis, R. G. Olmstead, D. Morgan, D. H. Les, B. D. Mishler, M. R. Duvall, R. A. Price, H. G. Hills, Y.-L. Qiu, K. A. Kron, J. H. Rettig, E. Conti, J. D. Palmer, J. R. Manhart, K. J. Sytsma, H. J. Michaels, W. J. Kress, K. G. Karol, W. D. Clark, M. Hedrén, B. S. Gaut, R. K. Jansen, K.-J. Kim, C. F. Wimpee, J. F. Smith, G. R. Furnier, S. H. Strauss, Q.-Y. Xiang, G. M. Plunkett, P. S. Soltis, S. M. Swensen, S. E. Williams, P. A. Gadek, C. J. Quinn, L. E. Eguiarte, E. Golenberg, G. H. Learn Jr., S. W. Graham, S. C. H. Barrett, S. Dayanandan, and V. A. Albert. 1993. Phylogenetics of seed plants: An analysis of nucleotide sequences from the plastid gene rbcL. Annals of the Missouri Botanic Garden 80: 528-580. Crepet, W. L., and D. W. Taylor. 1985. The diversification of the Leguminosae: first fossil evidence of the Mimosoideae and Papilionoideae. Science 288: 1087-1089. Crepet, W. L., and D. W. Taylor. 1986. Primitive mimosoid flowers from the Paleocene-Eocene and their systematic and evolutionary implications. American J. Botany 73: 548-563. Crepet, W. L., and P. S. Herendeen. 1992. Papilionoid flowers from the early Eocene of southeastern North America. Pages 43–55 in Advances in Legume Systematics, part 4, the fossil record (P. S. Herendeen and D. L. Dilcher, eds.). Royal Botanic Gardens, Kew, UK. Crisp, M. D., S. Gilmore, and B-E. Van Wyk. 2000. Molecular phylogeny of the genistoid tribes of papilionoid legumes. Pages 249-276 in Advances in Legume Systematics, part 9 (P. S. Herendeen and A. Bruneau, eds.). Royal Botanic Garden, Kew, UK. Dickison, W. C. 1981. The evolutionary relationships of the Leguminosae. Pages 35-54 in Advances in Legumes Systematics, part 1 (R. M. Polhill and P. H. Raven, eds.) Royal Botanic Gardens, Kew, UK. Dilcher, D. L., P. S. Herendeen, and F. Hueber. 1992. Pages 33-42 in Advances in Legume Systematics, part 4, the fossil record (P. S. Herendeen and D. L. Dilcher, eds.). Royal Botanic Gardens, Kew, UK. Doyle, J.J., J.L. Doyle, J.A. Ballenger, E.E. Dickson, T. Kajita, and H. Ohashi. 1997. A phylogeny of the chloroplast gene rbcL in the Leguminosae: taxonomic correlations and insights into the evolution of nodulation. American J. Botany 84: 541-554. Doyle, J. J., J. A. Chappill, C. D. Bailey, and T. Kajita. 2000. Towards a comprehensive phylogeny of legumes: evidence from rbcL sequences and non-molecular data. Pages 1 -20 in Advances in legume systematics, part 9, (P. S. Herendeen and A. Bruneau, eds.). Royal Botanic Gardens, Kew, UK. Gepts, P., W. D. Beavis, E. C. Brummer, R. C. Shoemaker, H. T. Stalker, N. F. Weeden, and N. D. Young. 2005. Legumes as a model plant family. Genomics for food and feed report of the cross-legume advances through genomics conference. Plant Physiology 137: 1228–1235. Graham, P. H., and C. P. Vance. 2003. Legumes: importance and constraints to greater use. Plant Physiol. 131: 872 – 877. Herendeen, P. S. 1992. The fossil history of Leguminosae from the Eocene of southeastern North America. Pages 85-160 in Advances in Legume Systematics, part 4, the fossil record (Herendeen, P. S., and D. L. Dilcher, eds.). Royal Botanic Gardens, Kew, UK. Herendeen, P. S. 2001. The fossil record of the Leguminosae: recent advances. In Legumes Down Under: the Fourth International Legume conference, Abstracts, 34–35. Australian National University, Canberra, Australia. Herendeen, P. S., W. L. Crepet, and D. L. Dilcher. 1992. The fossil history of the Leguminosae: phylogenetic and biogeographic implications. Pages 303 – 316 in Advances in Legume Systematics, part 4, the fossil record (P. S. Herendeen and D .L. Dilcher, eds). Royal Botanic Gardens, Kew, UK. Herendeen, P. S., and D. L. Dilcher. 1990. Diplotropis (Leguminosae, Papilionoideae) from the Middle Eocene of southeastern North America. Systematic Botany 15: 526-533. Herendeen, P. S., and D. L. Dilcher. 1991. Caesalpinia subgenus Mezoneuron (Leguminosae, Caesalpinioideae) from the Tertiary of North America. American J. Botany 78: 1-12. Herendeen, P. S., and S. Wing. 2001. Papilionoid legume fruits and leaves from the Paleocene of northwestern Wyoming. Botany 2001 Abstracts, published by Botanical Society of America (http://www.botany2001.org/). Herendeen, P. S., A. Bruneau, and G. P. Lewis. 2003. Phylogenetic relationships in caesalpinioid legumes: a preliminary analysis based on morphological and molecular data. Pages 37-62 in Advances in Legume Systematics, part 10, higher level systematics (B.B. Klitgaard and A. Bruneau, eds.). Royal Botanic Gardens, Kew, UK. Käss, E., and M. Wink. 1996. Molecular evolution of the Leguminosae: phylogeny of the three subfamilies based on rbcL sequences. Biochemical Systematics and Evolution 24: 365-378. Lavin. M., R. T. Pennington, B. B. Klitgaard, J. I. Sprent, H. C. de Lima, and P. E. Grasson. 2001. The Dalbergioid legumes (Fabaceae): delimitation of a pantropical monophyletic clade. American J. Botany 88: 503-533. Lavin, M., M. F. Wojciechowski, P. Gasson, C. E. Hughes, and E. Wheeler. 2003. Phylogeny of robinioid legumes (Fabaceae) revisited: Coursetia and Gliricidia recircumscribed, and a biogeographical appraisal of the Caribbean endemics. Systematic Botany 28: 387–409. Lewis, G., B. Schrire, B. MacKinder, and M. Lock (eds). 2005. Legumes of the world. Royal Botanical Gardens, Kew, UK. McKey, D. 1994. Legumes and nitrogen: the evolutionary ecology of a nitrogen-demanding lifestyle. Pages 211–228 in Advances in Legume Systematics, part 5, the nitrogen factor (J. I. Sprent and D. McKey, eds.). Royal Botanic Gardens, Kew, UK. Manos, P. S., and A. M. Standford. 2001. The biogeography of Fagaceae: tracking the Tertiary history of temperate and subtropical forests of the Northern Hemisphere. International J. of Plant Sciences 162: S77-S93. Morley, R. J. 2000. Origin and Evolution of Tropical Rain Forests. John Wiley & Sons. Pp. 378. Müller-Stoll W. R. and E. Mädel. 1967. Die fossilen Leguminosen-Hölzer. Eine revision der mit Leguminosen verglichenen fossilen Hölzer und Beschreibungen älterer und neuer Arten. Palaeontographica, Abt. B, 119: 95-174. Pennington, R. T., M. Lavin, H. Ireland, B. B. Klitgaard, and J. Preston. 2001. Phylogenetic relationships of basal papilionoid legumes based upon sequences of the chloroplast trnL intron. Systematic Botany 26: 537-566. Persson, C. 2001. Phylogenetic relationships in Polygalaceae based on plastid DNA sequences from the trnL-F region. Taxon 50: 763-779. Polhill, R. M. 1994. Classification of the Leguminosae. Pages xxxv–xlviii in Phytochemical Dictionary of the Leguminosae (F. A. Bisby, J. Buckingham, and J. B. Harborne, eds.). Chapman and Hall, New York, NY. Polhill, R. M., and P. H. Raven (eds.). 1981. Advances in legume systematics, parts 1 and 2. Royal Botanic Gardens, Kew, UK. Polhill, R. M., P. H. Raven, and C. H. Stirton. 1981. Evolution and systematics of the Leguminosae. Pages 1-26 in Advances in Legume Systematics, part 1 (R. M. Polhill and P. H. Raven, eds.). Royal Botanic Gardens, Kew, UK. Raven, P. H. and D. I. Axelrod. 1974. Angiosperm biogeography and past continental movements. Annals of the Missouri Botanic Garden 61: 539-657. Rundel, P. W. 1989. Ecological success in relation to plant form and function in the woody legumes. In C.H. Stirton and J.L. Zarucchi (eds.). Advances in legume biology, Monographs in Systematic Botany from the Missouri Botanical Gardens 29: 377-398. Sanderson, M. J., and M. F. Wojciechowski. 1996. Diversification rates in a temperate legume clade: are there "so many species" of Astragalus (Fabaceae)? American J. Botany 83: 1488-1502. Savolainen, V., M. W. Chase, S. B. Hoot, C. M. Morton, D. E. Soltis, C. Bayer, M. F. Fay, A. Y. de Bruijn, S. Sulllivan, and Y.-L. Qiu. 2000. Phylogenetics of flowering plants based on combined analysis of plastid atpB and rbcL sequences. Systematic Biology 49: 306-362. Soltis, D.E., P.S. Soltis, D.R. Morgan, S.M. Swensen, B.C. Mullin, J.M. Dowd, and P.G. Martin. 1995. Chloroplast gene sequence data suggest a single origin of the predisposition for symbiotic nitrogen fixation in angiosperms. Proceedings of the National Academy of Sciences USA 92: 2647-2651. Soltis, D. E., P. S. Soltis, M. W. Chase, M. E. Mort, D. C. Albach, M. Zanis, V. Savolainen, W. H. Hahn, S. B. Hoot, M. F. Fay, M. Axtell, S. M. Swenson, L. M. Prince, W. J. Kress, K. C. Nixon, and J. S. Farris. 2000. Angiosperm phylogeny inferred from 18S rDNA, rbcL, and atpB sequences. Botanical J. Linnean Society 133: 381-461. Sprent, J. I. 2001. Nodulation in legumes. Royal Botanic Gardens, Kew, UK. Steele, K. P., E. Tizon, R. C. Evan, C. S. Campbell, and M. F. Wojciechowski. 2000. Sister group relationships of Fabaceae and Rosaceae: phylogenetic relationships of Eurosids I. American J. Botnay 87: S160 (abstract). Wikström, N., V. Savolainen, and M. W. Chase. 2001. Evolution of the angiosperms: calibrating the family tree. Proceedings of the Royal Society of London, Series B 268: 2211-2220. Wing, S. L., F. Herrera, and C. Jaramillo. 2004. A Paleocene flora from the Cerrajón Formation, Guajíra Peninsula, northeastern Colombia. Pages 146-147 in VII International Organization of Paleobotany Conference Abstracts (21-26 March). Museo Egidio Feruglio, Trelew, Argentina. Wojciechowski, M. F. 2003. Reconstructing the phylogeny of legumes (Leguminosae): an early 21st century perspective. Pages 5-35 in Advances in Legume Systematics, part 10, higher level systematics (B. B. Klitgaard and A. Bruneau, eds.). Royal Botanic Gardens, Kew, UK. Polhill, R. M., and P. H. Raven (eds.). 1981. Advances in legume systematics, parts 1 and 2. Royal Botanic Gardens, Kew. Stirton, C. H. (ed.). 1987. Advances in legume systematics, part 3. Royal Botanic Gardens, Kew. Herendeen, P. S., and D. L. Dilcher (eds.). 1992. Advances in legume systematics, part 4, The fossil record. Royal Botanic Gardens, Kew. Sprent, J. I., and D. McKey (eds.). 1994. Advances in legume systematics, part 5, The nitrogen factor. Royal Botanic Gardens, Kew. Ferguson, K. I., and S. C. Tucker (eds.). 1994. Advances in legume systematics, part 6, Structural biology. Royal Botanic Gardens, Kew. Crisp, M. D., and J. J. Doyle (eds.). 1995. Advances in legume systematics, part 7, Phylogeny. Royal Botanic Gardens, Kew. Pickersgill, B., and J. M. Lock (eds.). Advances in legume systematics, part 8, Legumes of economic importance. Royal Botanic Gardens, Kew. Herendeen, P. S., and A. Bruneau (eds.). 2000. Advances in legume systematics, part 9. Royal Botanic Gardens, Kew. Klitgaard, B. B., and A. Bruneau (eds.). 2003. Advances in legume systematics, part 10, Higher level systematics. Royal Botanic Gardens, Kew. Angiosperm Phylogeny Website. 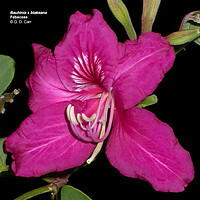 For more information on the family, search for Fabaceae. Bean Bag. A newsletter to promote communication among research scientists concerned with the systematics of the Leguminosae/Fabaceae. International Legume Database & Information Service. The International Legume Database & Information Service (ILDIS) is an international project which aims to document and catalog the world's legume species diversity in a readily accessible form, including publications, electronic resources, and enquiry services. Medicago.org. Medicago truncatula, A model for legume genomic research website. Legume Information Service at NCGR. The Legume Information System (LIS) is a publicly accessible legume resource that integrates genetic and molecular data from multiple legume species. Pierre Guertin's Philatelic Herbarium shows examples of stamps that species of plants have appeared on, many of which belong to Leguminosae. Click on Liste Taxonomique and scroll down about halfway to get to the stamps with pictures of legumes on them. Development of these family Fabaceae webpages for the Tree of Life Web Project, and the research on the phylogenetics of legumes by M. F. Wojciechowski and members of his laboratory at ASU, are supported by a grant from the US National Science Foundation (Arlington, VA) to MFW. We acknowledge and thank the NSF for their support.